The launch of the Samsung Galaxy Note Edge last year became a cause considerable excitement for Samsung fans worldwide. Apart from having top notch specifications, the device came with a unique curved screen which displayed notifications and such. Soon later, Samsung was rumored to have a similar edge variant of its upcoming Galaxy S6 flagship under the works as well. The Samsung Galaxy S6 has been making regular rounds of the rumor mill for quite a while now, and while Samsung is yet to make any concrete announcements about its upcoming flagship, looks like another Korean manufacturer, LG has beaten it to the chase when it comes to a dual edged smartphone. 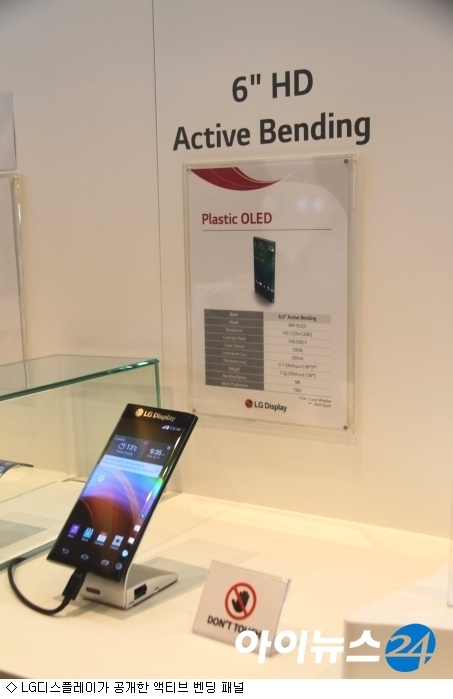 LG Showcases It Very Own Active Bending Plastic AMOLED Screen At CES. Looking to perhaps beat Samsung at its own game, Korean manufacturer LG has showcased its own variant of a curved display at Las Vegas. The image above shows the manufacturer’s very own Active Bending Plastic AMOLED screen shown off to select partners. In addition to showcasing the panel, its also believed that the company is ready to manufacture and sell the panel to interested companies. The panel showcased has a rather low resolution of 720 x 1080 though this could of course be due to the fact that the company was merely showcasing the panel in question. Whatever the case may be, LG is also looking to ‘think different’ with the LG G4, of which we’ve heard little so far about. According to Director Communications over at LG, the company wants the G4 to stand out from the other Android flagships available in the market. So will be get to see a dual edged variant of the LG G4 as well? Only time will tell. But if LG’s dual edged plastic AMOLED screen is a hit amongst manufacturers then dual edged curved screens could very well be the next major thing in Android world. We’ll keep you updated as this develops. Stay tuned.